I had a wonderful time reading at The Poetry Cafe in Covent Garden, London, on Saturday night, with Jackie Wills, tutor from the Aldeburgh Eight Advanced Poetry Seminar, and the 2015 Aldeburgh Eight Poets, who are Andrew Rudd, Anita Pati, John Challis, Kathy Pimlott, Miranda Yates, Seán Hewitt, Suzannah Evans, and me. 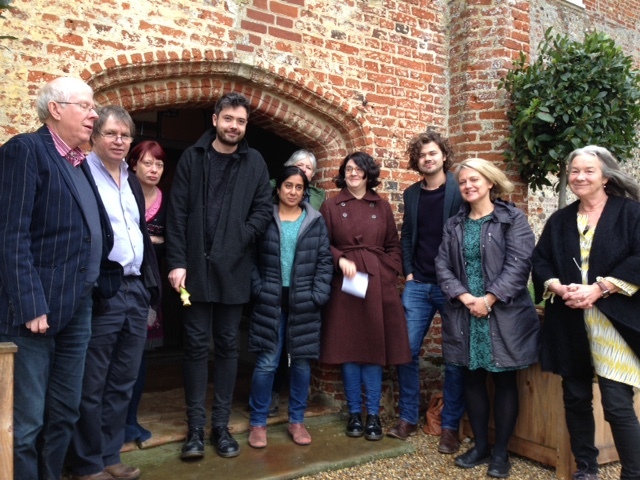 It was such a pleasure to see everyone again, the first time we’d had a reunion since our eight ways together at the Aldeburgh Festival and on retreat in Bruisyard Hall last November. As the name suggests there’s a proper cafe and bar upstairs and a well-laid out room with microphone downstairs. I’ve read there once before, for the launch of my pamphlet, and it’s a friendly, intimate space, packed-out for our reading on Saturday, which was delightful for us, and the audience were so warm and encouraging. While I was in London, I had a chance to catch up with some of my family, including my niece Leah and her husband Mickael, who have recently finished renovating a beautiful, Grade II listed, Victorian house in Peckham, SE London which they also run as a Bed and Breakfast place. You can be in London Bridge (The Shard & Tower Bridge) in under 10 minutes, Canary Wharf in 15 minutes, Picadilly Circus, Oxford Street, Waterloo, Green Park (Buckingham Palace) in 25 minutes. Trendy Shoreditch, Spitlefields Market, Brick Lane, Liverpool Street, Stratford Olympic park, Westfield Shopping in 20-30 minutes. Even if I wasn’t related to Leah, I’d recommend this as a super-comfortable and competitively priced place to stay. Full details at airbnb here. This is great. I find picking accommodation in London really tricky. Thank you.